One of the first rules in sewing is to pre-wash your fabric before you cut it out, so that any fabric shrinkage is taken care of before the garment is made. Who wants to spend hours sewing a new garment, wear it once, then find out after the first wash that it has shrunk beyond wearable? I think we all live in fear of that! So we diligently follow the rule – we pre-wash our fabric as we are told to do, so our precious hand made garments remain wearable past the first wash. But is pre-washing always the right strategy? Yes and No. Read on – and I’ll let you decide! Some fabrics are known shrinkers – like cotton and viscose, but it might surprise you to know that many modern fabrics shrink a negligible amount. There are disadvantages to pre-washing, and sometimes they outweigh the advantages. I personally prefer not to pre-wash unless I have to, but I believe it is important for sewers to know the advantages and disadvantages of pre-washing so they can make their own judgement call. The first disadvantage is pretty obvious – time and inconvenience. To be honest most of us sewing at home are quite happy to spend the time and forgo the inconvenience of pre-washing (not to mention drying, and ironing!) to ensure our garments don’t shrink. I mention this point mainly because in the garment industry pre-laundering is a major inconvenience and time cost – imagine having to wash several bolts of fabric before going into production! It is simply not practical, so the industry has developed other ways which I will mention later. Notice the change in texture from the unwashed swatch on the left side to the washed swatch on the right side. There is a definite loss of sheen. This is going to happen anyway with your finished garment, but fabric finishing actually makes the fabric easier to handle when laying up, folding, cutting and sewing. I really notice the difference during handling, so it seems a shame to remove it! Distortion is another disadvantage of prewashing. In the textile industry final pressing occurs with the fabric tensioned out flat and squared. Compare this to running a hand iron over a large piece of fabric, with irregular steam and pressure, with most of the fabric hanging off an ironing board – distortion of the grain is inevitable. Crepe weaves are especially susceptible to this, when washed they ‘crepe up’ and are flattened again when pressed. Uneven pressing will lead to uneven width and length of the piece, and the grains are no longer straight and perpendicular. I’ve accentuated it here, but hope this photo demonstrates the grain distortion that can occur with irregular ironing. If I laid a pattern on this fabric and cut it out, the hemline and seamlines would be crooked. 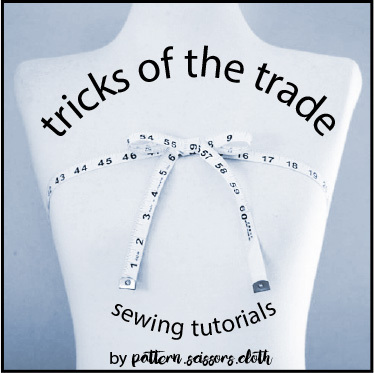 Not only would the seams, hemlines and fit be crooked, but a wiggly grain makes sewing more difficult! Cutting the fabric accurately and on-grain is far more important to me than experiencing slight shrinkage after the garment is complete. As you can see there are some disadvantages to prewashing. So – what should you do? Source a better less-shrinking option. Declare the shrinkage factor to the customer. In a loose fitting garment (like an oversized shirt) shrinkage may be imperceptible. If the garment is close fitting (like a fitted shirt) shrinkage may noticeably change the fit and needs to be acknowledged at retail level – like labelling with 5% shrinkage after washing. Enlarge the pattern according to the fabric shrinkage specifications, then wash/press the garment after making to return it to the correct size. This involves a lot of testing for accuracy. Make a test square pattern in card – 20 x 20 cm, with a lengthwise grain arrow. A bigger square will give a more accurate the result, but I’ve found 20 cm to be a workable size. 10 x 10 cm is too small for accurate results. Cut out this square with a rough 1″ allowance. If you think it is going to fray horrendously in the wash, allow a bit more and overlock the edges. Cut off any selvedge. Notch either end of the grainline so you can easily recognise the warp direction once washed. Wash and dry the swatch according to the fabric instructions. You could wash it more aggressively if there is a risk that could happen to the garment in real life. Measure the swatch down the middle. Measure warp and weft directions to assess the different shrinkage in length and width, and measure pre and post pressing if you want to see how this changes things too. As you can see I’ve written this formula on my 20cm square because I can never remember it off-hand! Hate maths? For a 20cm square, 1cm shrinkage = 5%, 0.5cm shrinkage = 2.5%. Easy. Some fabrics grow! You can use the same formula but will end up with a negative value. Now you know the % shrinkage of your fabric, but what does that mean in practice? Imagine a pencil skirt. If your hips measure 100cm, and your fabric shrinks 5% on the crossgrain, it would end up fitting a 95cm hip – that is exactly one garment size smaller! Obviously in this case you would need to prewash your fabric. This fabric is pretty bad with values of 4.5 to 7.5% for shrinkage, and I would reject it if I was manufacturing garments – maybe that is why I discovered it at a designer garage sale! 2.5% is considered within acceptable limits in the garment industry, and in reality most consumers would not notice this amount of shrinkage unless the garment is very fitted. I often make garments for myself knowing that 2-3% shrinkage will occur after washing, but only if there is slight ease to do so. Lengthwise shrinkage usually affects the length of a garment, so you might prefer to allow for it when cutting rather than prewashing. For example if the lengthwise shrinkage is 2.5% and your skirt is meant to be 50cm long, you’ll need to add 1.25cm. Another factor to consider is that lengthwise shrinkage might cause things like that zip on your bomber jacket to become wavy. To prevent shrinkage inconsistencies like this I recommend blockfusing all the way. Once you start measuring the shrinkage of your fabrics, you might be surprised to find out that many fabrics don’t shrink as much as you think. With time you will learn which fibres and weaves do, and which don’t. Some fabrics will always shrink, but armed with the facts you can now weigh up the pros and cons of pre-washing versus the expected shrinkage of your fabric. Knowledge is key. Are you a diligent pre-washer, or do you only pre-wash when you remember?! Or do you already test wash your fabrics? I always throw viscose into the wash first! Thank you for this interesting post! I always love to learn more from the industry perspective and would love more posts like this. The one advantage I would add for prewashing is that the finishing used on the fabric might irritate some people’s skin – I get quite bad eczema on my hands and prewash in case the finishing causes a flare-up. Glad you enjoyed the read Siobhan, and I agree – preventing an eczema flare up is reason enough to always prewash! Thanks Hila! Test washing gives a great insight into how a fabric behaves, so we can make an informed decision. I’ve learned a lot about fabrics test washing! So interesting! I’m totally a prewasher, all the way! And that’s cool too! We all have our own ‘system’ for doing things – mine’s just a bit different, lol! This is so informative! I have never thought to measure for shrinkage and have always pre-washed just about everything. I’m thinking back on some luscious heavy silk crepe I made a dress with recently, and remembering how some pieces were pretty wonky after cutting. I definitely prewashed that fabric and I wonder if it would have been better behaved if I hadn’t? Also, I’ve wondered in the past if fabric is prewashed in the garment industry, so thanks for solving that mystery. I find it is the re-pressing that can make fabric really wonky, but once you know that you can take extra care, like pressing with the grain, or sectioning the fabric by tearing along the grain. I’m going to have to hunt out your dress now, it sounds gorgeous! There are no pictures unfortunately but it turned out well in the end despite the wonkyness. I used a Rachel Comey for Vogue pattern. Will try pressing with the grain next time! Fascinating post! I’m also a diligent pre-washer. But then I tend to sew with lots of cotton which is notorious for shrinking. So interesting to read what industry does. Great post. I guess the industry has adapted around using large amounts of fabric, as home sewers we can take from that what we want! Cotton is definitely a problematic one! Amazing post! I started to prewash many fabrics after I had a finished garment ruined by the first wash. After a while of working with many diferent fabrics we star to know them and how they’ll do. Experience does go a long way with fabrics! The testing process is a great learning curve too, even if you do plan to pre-wash everything. What about bleeding / color running? That’s the reason I pre-wash, or at least soak, most of my fabrics. I sew a lot of dark colors and no matter what the fiber type or quality, most of them will bleed in the first wash. I’d rather they did it alone, and not ruin a laundry load of other clothes! That’s a great point Emily, things like raw denim could ruin a whole laundry load! I would always wash these fabrics separately for the first few washes, and you’ve probably seen labels on ready-to-wear garments recommending this. The last time I did not prewash a fabric — a heavy cotton, that acted entirely stable the whole time I sewed it up — it shrank appallingly. I’d made four garments from that length of stuff. All, all of them went to the thrift store. An inch or so around I could have attributed to a slight weight gain, but not four inches around and six inches in length. Thankful that I did not pay full price for it — it was a gamble, buying that end roll from the bargain bin. I still had the fun of sewing … and got to wear everything one time each, before wash day. And some much smaller woman will have the joy of wearing my slightly-used clothes, should they sell at the thrift store. Otherwise, they’ll go for scrap to the paper mills just north of here. That sounds like a lot of work to avoid prewashing. I don’t often buy one cut of fabric at a time, it’s usually several and I wash the cuts together as if they were garments and would be grouped together anyway. They are washed the moment they come in the house rather by mail or in-store purchases. I’ve been “burned” twice so the time to prewash is far more useful than sewing and later realizing something is a wadder because of the fabric. So it isn’t just about shrinkage, IMO. I’ve had textures change — a suiting that once washed was far too thin for the project I intended. I’ve had colors run/bleed — would rather know that before it becomes a garment. I’ve had distortion apart from shrinkage –again, it’s sad when the cut of fabric is unusable but much harder to stomach a completed garment (aka HOURS of work) that’s ruined. I used to not prewash ponte knits until I made a fantastic wrap skirt from a black ponte and it shrunk and distorted on first wash. EVERYTHING goes in to be prewashed! You sound totally organised with your pre-washing system! It honestly doesn’t take long for me to draw around the test square and wash/dry it (I have been known to use the kitchen sink!) and it tells me in 5 mins what I need to know. I’m often amazed with the texture change – like you had with your suiting! I might have to try some African wax prints! The test square is a great way to let you know what sort of fabric you are working with, I hope it helps! I mostly wash a swatch to see what happens. I buy fabric by the box and I refuse to wash umpteen yards of fabric before I can shelve/sew it. However, prewashing is fairly new to me so I do have shelves of unwashed fabric that have been sitting for years. If it’s dusty or seems iffy in stability/quality–I wash the entire piece. I have a lot of stored fabric too, and some of it is so old I cannot remember the fibre content, so washing a swatch tells me what to do! I do prewash those fabrics that will be washed once sewn. Unfortunately, even that does not always stop future shrinkage. I’m thinking about a few pairs of jeans that seem to continue shrinking in length with every wash. Rather annoying! Continual shrinkage is so annoying! I don’t know any way around it but to test it three times! This is very helpful. Thanks for this analytic approach! Thanks, I hope it is of help – even if you still always pre-wash, washing a test square gives you an idea of what to expect. Oh great to know – especially about the uneven ironing, I’d never really thought about that before. I am in the habit of throwing things in the wash as soon as I get them home but I will definitely consider not washing crepes or shifty type fabrics in the future as I already have enough problems cutting them out precisely! Thanks so much for writing up this post! Thinking about distortion from washing/pressing is especially interesting and something I hadn’t thought about. I think I’m going to continue washing the fabrics I tend to use over and over again – denim, linen, viscose, cotton wovens – but will start testing for the more complicated fibers. The one reason I always want to prewash is because my mom had her home infested with bugs from fabric she bought. We never know the path these fabrics take to our homes and would be appalled at the conditions in places they are stored. I still don’t always prewash but this and the chemical smell on some pieces encourage me to do so. I prewash to check for colour fastness too. I am a person who buys fabric and then doesn’t wash it until I use it. This week I picked out 3m of printed lawn/voile that I purchased online last year, handwashed and line dried it. When I ironed it I discovered it had long tears up and down the length of the selvedge, 10-20cm in – they were very hard to find in the large scale print but quite obvious while ironing. I contacted the store but they don’t have any more of that fabric left. I pre-soak & dry after being burned by a dress no longer fitting after going to the effort of sewing it. I don’t think I find it any harder to pre-soak in very hot water & then air dry than to test a sample and calculate shrinkage rates. I also only sew with natural fibres so there’s almost always going to be some sort of shrinkage. As far as the final finish changing, if it’s going to be something I don’t like enough to wear after washing then I’d rather know before I invest more effort in making it up. After all at some point I’ll have to wash the garment and I don’t bother drycleaning anything. You make a good case for the sheen of new fabric, but I’m too afraid of bedbugs and dye rubbing off on my hands to not be a pre-washer. I prewash. I sew natural fibres which can shrink. I also hang fabrics to air-dry very carefully to avoid distortion of the weave. (I never use a drier on clothes anyway). Shrinking aside here are a few reasons why I pre-wash. I live in the tropics. Clothes get washed to death here. I need to know the fabric I’m using is up to it. Pre-washing gives a pretty good indicator of how the fabric will wear over the life of a garment. If it looks like it won’t cope with washing well I can make it into something that gets less washing, or an easy pattern so when it dies quickly I’m not mad at having spent hours and hours sewing it. I have ridiculously sensitive skin and am prone to respiratory tract allergies. I can react to some sizings. If the colour runs I want to know about it beforehand. I use a colour catcha sheet in the wash with the fabric, which shows if the colour runs. I get so excited to finish a garment I don’t wash it before I wear it! Non-pre-washed fabric can make my skin can react. eeek. It can also make a fabric more impervious to water, making it less breathable. I need breathable! In fact if pre-washing doesn’t get rid of all the sizing, I soak the fabric or finished garment in vinegar to get rid of it and restore the fibre’s natural breathability. Interesting topic. A lot of my fabric is sourced from TradeMe, so I wash it by default because I don’t know how it has been stored. I’ll certainly give more thought to whether pre-washing is actually needed for future projects where I’m using new fabric. Also, I noticed an error/typo in your post — you have the calculation as “% shrinkage = pre-wash cm – post-wash cm/post-wash cm x 100” but you probably meant that to be “% shrinkage = pre-wash cm – post-wash cm/pre-wash cm x 100”, as that matches with all of your example calculations. Thanks for that Jason! I did have it wrong in my original draft, and thought I changed all the details to be correct – obviously not! I’ll edit it right now! I imagine some fabric from TradeMe could have been stored for a long time, so washing it sounds a good idea. I guess the fabric content is sometimes a mystery too! I used to be 100% in the prewash camp, but now I’m a bit more flexible. Rayon is always a tough call for me, but I usually wash it in a sweater bag in very warm water, and dry it on the hottest setting my dryer has (usually only for a few minutes) because I’ve had a lot of bad luck with rayon shrinking, even after pretreating, and this method also brings out the durability of the fabric–if it doesn’t have holes after that first wash, I feel confident it’ll last. I’m tired of making something out of challis only to find holes after the second wash (which is always in cold with very low heat drying) when I was more gentle with the fabric. I found your insight into RTW interesting. Mostly because I’ve always had to buy tall/long jeans whenever possible (I’m 5’2″ with longer than average legs–but let’s face it, they’re still short!) because after a half dozen washes they’d be so short I’d look like a poor kid after a growth spurt. I’ve been there, and I’m not interested in nostalgia. It seems to be this way irrespective of brand/cut/price, so I really wish that RTW would start factoring that in along with the rest of it. This is fascinating! I’m an avid pre-washer because our house generates an insane amount of laundry. While that sounds paradoxical (why does she add more laundry to the laundry mountains?) it’s made it necessary for either parent in residence to chuck on a load of laundry whenever we stop to take a breath. Anything I make *may* be wooshed through a hot wash and dry instead of a loving gentle-cycle while I’m innocently driving someone to swimming lessons*, and Him Indoors manfully does chores. I also love pre-washing linen, because it just seems to get softer and nicer every wash. I barely dry-clean anything; my wool coats and velvet blazer are the only things not submitted to the rigors of the laundry mountain/punishment zone. But it’s useful to think about how pre-washing distorts fabric, and how pressing does the real damage. I’m a slipshod presser, and I’ve had some distorted necklines as a result. Thanks for the post! *RIP, rayon dress. You were beautiful in your short life.